Author(s): Neeraj Kumar, Rajendra N. Goyal. Department of Chemistry, Indian Institute of Technology Roorkee, Roorkee -247 667 (India). 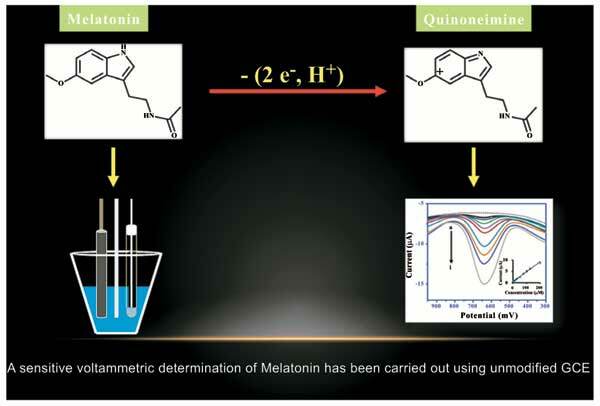 Introduction: A simple, sensitive and reliable sensor has been explored for the determination of Melatonin (MEL) using cyclic voltammetry (CV) and square wave voltammetry (SWV). Method: Irreversible oxidation of MEL was found to proceed through an adsorption controlled pathway at the glassy carbon electrode. The quantitative estimation of MEL was performed using SWV in a linear concentration range of 5-200 µM with a sensitivity of 0.0437 µM/ µA and a limit of detection of 0.3432 µM. The proposed protocol was also applied for determining MEL content in pharmaceutical samples and recovery studies in human urine samples were also performed. Result: The observed results demonstrated a good agreement with the stated values. Keywords: Melatonin, glassy carbon electrode, voltammetry, oxidation, human urine. Affiliation:Department of Chemistry, Indian Institute of Technology Roorkee, Roorkee -247 667 (India). Keywords:Melatonin, glassy carbon electrode, voltammetry, oxidation, human urine.